Fits all Solid-Pack Class-A chimneys. This is a great cap that is rated for all fuels. The four legs inside the screen are pre-welded to the base. The lid is then bolted to the legs at the factory. You just take it out of the box and it's ready for you to install on your chimney. The Guardian Cap attaches to both reline pipe and solid pack, class-A chimneys by sliding inside with a tight friction fit. That's all there is to it! Why pay someone $50 or more to install it when you can do it yourself it minutes? 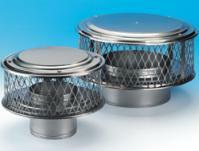 This cap is available in 5"-12" diameters. The 5"-8" models come with a 5" high screen and 13" diameter lid. The 9"-12" models come with a 6" high screen and 17" diameter lid. All have a 5" high base. Standard mesh is 3/4". Carries a lifetime warranty with all fuels. Note: Not to be used with an air-insulated chimney. Fits 4 inch inside diameter chimney. Fits 5 1/2 inch inside diameter Chimney. Fits 6 inch inside diameter chimney. Fits 8 inch inside diameter chimney. Fits 9 inch inside diameter chimney. Fits 11 inch inside diameter chimney.